For my son’s first birthday, we did a comic book super-hero theme in primary colors. I spent hours looking online for printables and party ideas, but I didn’t find much that was free and I didn’t feel like paying. The solution? I made my own printables; cupcake toppers, food table labels, conversation bubble labels for the picture board, and a few fun graphics for decoration. It was easy enough, so I thought I would share. 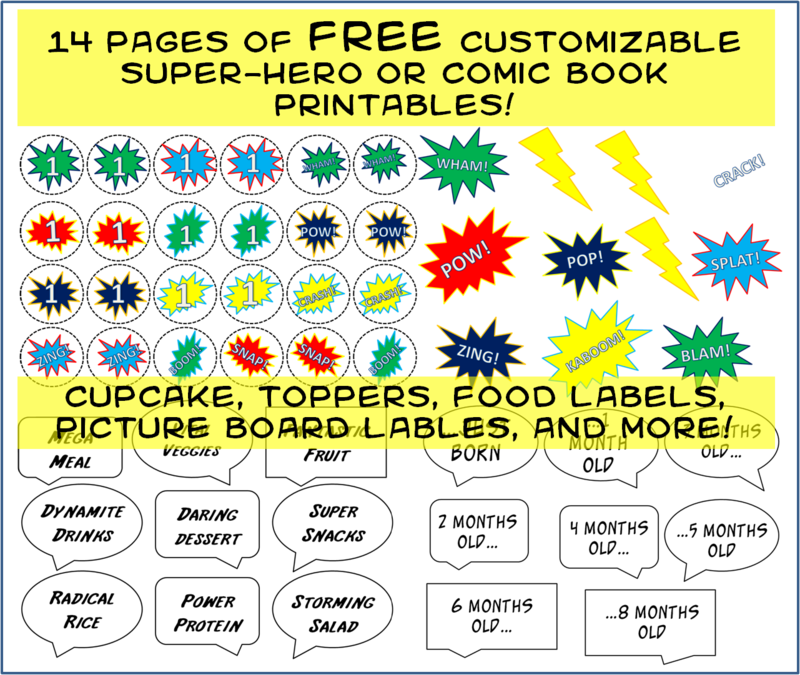 There is also star cupcake toppers, so they are really quite flexible to use for different parties – super hero, comic book, action movies, 4th of July, stars, primary colors, boys, girls, etc. When you can alter the colors, it can fit all sorts of needs. If you have any troubles, feel free to leave a comment or send an email, and I will try to help!